In an interview with CNN's John Roberts, Dodd — a supporter of Barack Obama — said he thinks the race will end when "the candidates decide they can't go any further. "The last thing you want to do is lecture candidates to get out of the race," Dodd also said. "Over the next couple of weeks, as we get into April, it seems to me then, that the national leadership of this party has to stand up and reach a conclusion," he added. While the President may think that it's right to offer immunity to those who break the law and violate the right to privacy of thousands of law-abiding Americans, I want to assure him it is not a value we have in common and I hope the same can be said of my fellow Democrats in the Senate. "For too long we have failed to respect the rule of law and failed to protect our fundamental civil liberties. I will do what I can to see to it that no telecommunications giant that was complicit in this Administration's assault on the Constitution is given a get-out-of-jail-free card." Senate Democrats and Republicans reached agreement with the Bush administration yesterday on the terms of new legislation to control the federal government's domestic surveillance program, which includes a highly controversial grant of legal immunity to telecommunications companies that have assisted the program, according to congressional sources.
. . . It was a victory for President Bush, whose aides lobbied heavily against the Democrats' [House] bill, and an embarrassment for House Speaker Nancy Pelosi (D-Calif.), who had pushed for the measure's passage. The draft Senate bill has the support of the intelligence committee's chairman, John D. Rockefeller IV (D-W.Va.), and Bush's director of national intelligence, Mike McConnell. It will include full immunity for those companies that can demonstrate to a court that they acted pursuant to a legal directive in helping the government with surveillance in the United States. 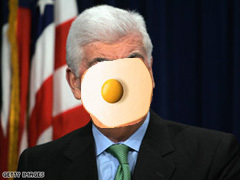 I speak for me only as usual and I am a supporter of the Chris Dodd candidacy for the PResidency. Connecticut Sen. Christopher Dodd is the longest of long-shot candidates for the Democratic presidential nomination. But he doesn't seem too agitated about that. He's an experienced politician. He knows how the caucus game often breaks late. Because of his 33 years of experience in Congress, he also knows something about U.S. foreign policy and the war in Iraq. Obama to reboot his Iraq policy and rhetoric. Last week I implored Barack Obama to step up on Iraq. On Wednesday of this week, he will be doing just that. Context and what to look for below the fold. Take the damn ball, Senator Obama. An open letter to Senator Barack Obama from a supporter. Senator Obama, in your short time in the public eye you have shown great wisdom, judgment, and vision. Your greatest strength is the ability to fuse pragmatism with idealism. This often means eschewing traditional showboating and playing for the cameras in order to build consensus that builds towards progressive goals. However, no single approach works for every problem, and building consensus is not working on the problem of Iraq. There was a time for Congress to be the steering wheel of our Iraq policy. Now, someone needs to slam on the brakes.